Servant House – A Healing Place | Nan Tubre Writes . . .
Hoo-Boy, I’ve been having a rough time of it lately. You know how it goes, you cruise along just fine, then you hit a bump in the road and suddenly your going off a cliff. That, my dear friends, is called ‘life’. So, my friend Mary Lofton told me about a healing Mass taking place at the Servant House in Marksville, La. last Wednesday. Well, of course I wanted to go! Who wouldn’t want to receive a healing? I grabbed a couple of friends from the prayer group I attend, Mary grabbed a friend too and we made arrangements to meet there. It was good to see each other again. Back in the day, she and I belonged to a prayer group in Pineville, La. That period of my life was probably the one in which I grew in my faith the most. That is, until now. I don’t know but I guess because I’m older now, I understand the lessons put before me a little better. Sometimes. As you know, the Lord works in mysterious ways. It seems to me He may be a little OCD about the way He wants things done. Check it out; He made the heavens and the sky first so the earth and solar system would have space to exist. He created the land and the sea, rather yin and yang, don’t you think? Soon He created man out of the dust of the earth, and from his rib He created woman (I’ve heard tell that He was just practicing with the first one, lol). The list goes on and on. Moses to the promised land. King David to Jesus. It all had to be in a certain order. It was important and as we look back on history, we might understand a tiny bit of the reasons why. You gotta love the Big Guy, right? He has a way with puzzles, and I for one respect, honor, praise and am deeply indebted to Him for that. I often wonder if allowing the human race to have the gift of free will ever puts a kink in His plans? That’s an audacious thought, isn’t it? But then who (in their right mind) believes God talks to them? It takes a special person to hear God whisper His plans, a very special person indeed. I’ve been privileged to meet two of them, Aggie Neck and Donna Culotta. 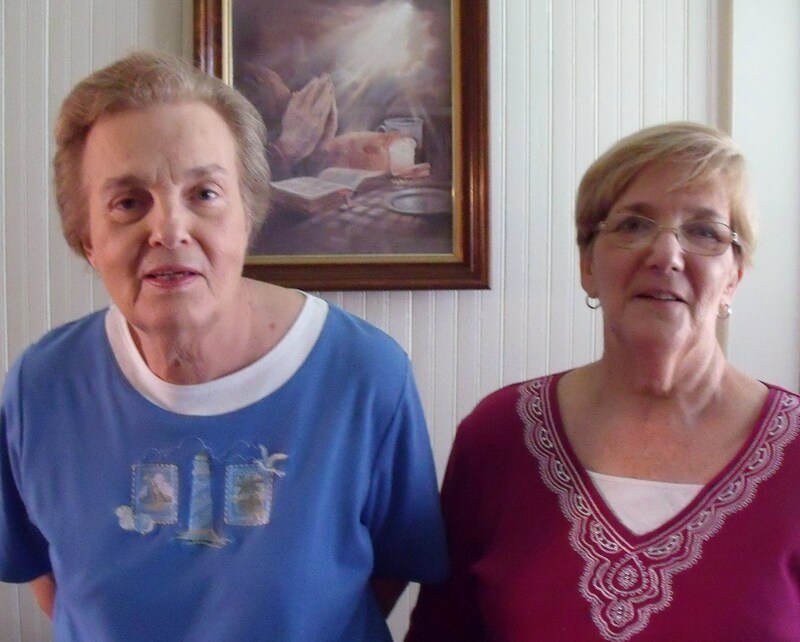 More than 25 years ago, Aggie and Donna met through their work with the Diocesan Service Committee in Alexandria, Louisiana. Aggie shared her vision of a community of prayer with Donna and the rest of the story goes like this: They heard, they listened, they believed, they acted. They opened Servant House. I choose to call them kindred spirits as both shared an interest in learning more about the gifts of spiritual direction and healing. Somewhere around 2004, Donna had the opportunity to spend time in Florida with Dionne Bronin and Barbara Schleman at the School of Spiritual Directors, from which she was able to graduate in 2006 and obtain certification in that skill. It was a puzzle/plan with a lot of pieces having to fit into place. And it’s an ongoing ministry of love in His name. 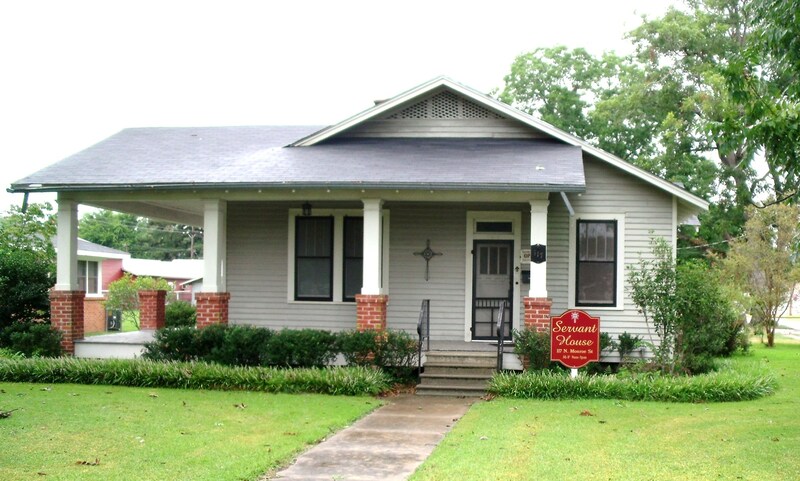 You will find Servant House at 117 N. Monroe St. in Marksville, Louisiana. It is situated in a quiet neighborhood surrounded by lots of green grass, flowers and craggy old bent trees. As a matter of fact, it kind of reminds me of my grandmother’s house. 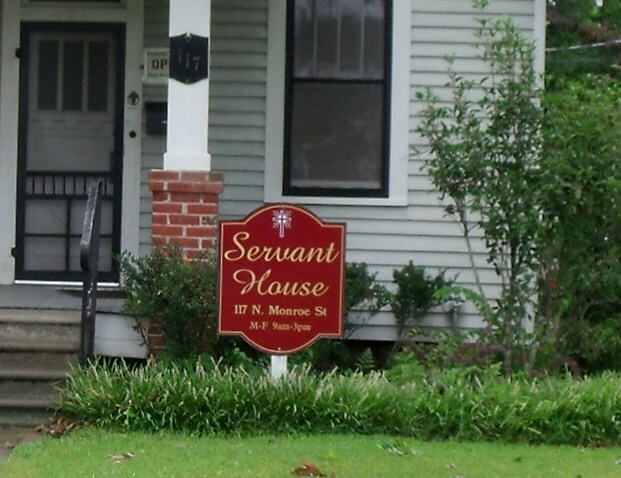 Established on October 15, 1989, Servant House has been a home for many who seek inner healing and spiritual direction. Sometimes a person might show up at the door with a need for someone to listen to them, to talk to someone who cares and prays and believes. Fulfilling such a need in a person is validating for them, an attribute worth far more than prestige or money. Having that kind of gift must be God-given. Although Servant House was and still is all about healing, the community of prayer doesn’t stop there. They take part in a prison ministry, a Charismatic prayer meeting every Monday evening (7p.m. ), a healing Mass the 2nd Wednesday of the month, Bible studies, and they are very active in the production of the Steubenville South Youth Conference. They also offer the building for the Avoyelles Right To Life meetings the last Thursday of the month. And every December they sponsor a special Mass for loved ones who have passed on. One more ministry of the Servant House is a food pantry. They open for one hour first thing M-F mornings to accommodate those in need. Unfortunately, there have been times when funding is low and there wasn’t enough money to stock the food pantry. Servant House depends on donations to keep it open. Donna makes string rosaries and sells them for $3 a piece to help with funding. That’s dedication in action, but it’s not enough. It would be a wonderful thing if they could get more donations coming in from – let’s say – you, if at all possible. Aggie and Donna did not ask me to solicit on their behalf but I feel called to do so. They are two kind, loving souls who have a divine job they are called to do and they do it well. Their drive and determination to serve Jesus Christ is inspirational. If you feel lead to help this ministry grow, give them a call at 318 253-7810. You will be blessed. And while you are at it, please pray for peace. The whole world needs your prayers. 3) pass the award forward to those bloggers you feel are most deserving, in particular what it is about their blogs you find inspiring. Any questions? Contact me via email.